Clayoquot Wilderness Resorts & Spa promises discriminating travelers two world-renowned ultra-luxurious eco-resorts, four-star accommodations, otherworldly coastal cuisine, super natural adventure, and some of the most breathtakingly beautiful wilderness frontier left on the planet. Equidistant from Tofino, and just a few miles from Quait Bay as the eagle flies, rests the über-luxe 21st-century-eco-safari style Wilderness Outpost at Bedwell River. If you plan on flying in, get yourself to Vancouver, British Columbia or Seattle Washington, and we'll take care of everything else. Guests flying in from Vancouver, enjoy preferred rates from Regency Air and Atleo River Air, on their regularly scheduled and resort-chartered flights. But, regardless of your jumping-off point, resort staff will be happy to assist with the final leg of your journey - the commuter plane flights to and from Tofino, British Columbia. If you arrive from Seattle, Vancouver or Victoria on-board a wheeled aircraft, you will land at the Tofino airstrip, at the Longbeach Golf Club. The Seattle to Tofino flight time is approximately three hours, while Vancouver to Tofino, and Victoria to Tofino are both less than one hour. Upon landing in Tofino, a resort shuttle will greet you, stow your bags, and take you on a scenic 15-minute drive to the charming seaside village of Tofino. If you arrive early - 45 minutes or more before the scheduled afternoon water taxi or float plane departs - you could spend some time exploring the shops, galleries, and cafes of the town centre. Otherwise feel free to relax in the resorts office lounge, with a cup of freshly-brewed coffee or a glass of wine, then escorted to the marina and onto a resort vessel for the scenic 30-minute ride to the Bedwell River Outpost. Enjoy the skipper's colour commentary and watch for eagles, seals, whales and other wildlife along the way. Atleo River Air and Tofino Air floatplanes fly direct to both resorts. **If you become delayed en-route to your plane, please take a moment to call the airline, then call us, or ask the airline to call us. Because we have to dispatch ground and water transfers in advance of your arrival, we appreciate a heads-up regarding any changes. 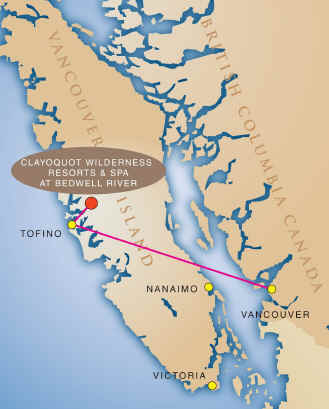 Clayoquot Wilderness Resorts & Spa properties are located in the transition zone of the Clayoquot Sound Biosphere Reserve Area, in one of the best intact examples of temperate rainforest left on earth. 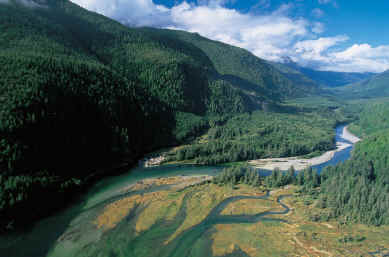 Designated in 1999, by Unesco (United Nations Educational, Scientific and Cultural Organizations) Programme on Man and the Biosphere, the Clayoquot Sound Biosphere Reserve was deemed a habitat so important to the biodiversity of the planet that the world community recognizes it as such and creates a cooperative reserve to protect and sustain it. The spirit of the Biosphere Reserve governs resort operations and forms the backbone of all policies and sustainable development. 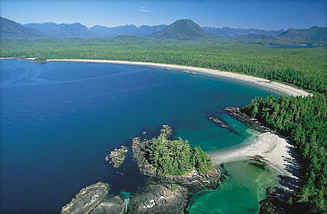 The Trust is committed to exist in Clayoquot Sound in an entirely sensitive and environmentally sustainable manner. The property employ local men and women, and through various education-based naturalist and recreational offerings, contribute to the enhancement and global understanding of the Clayoquot Sound Biosphere Reserve Area. All aspects of resort operations are low-impact and are updated as technology allows. Comprehensive recycling governs food and beverage service, organic gardens reduce commercial dependency, gravity-fed turbines generate fuel-less electricity and hot water, toilets composte waste materials into organic matter, and all marine and land adventures are non-intrusive and conservancy-driven. And finally, Clayoquot Wilderness Resorts & Spa works hand-in-hand with the Nuu-Chah-Nulth First Nation people, as well as local, regional and federal governments in developing sustainable, environmentally responsible development and environmental enhancement programs that benefit all.